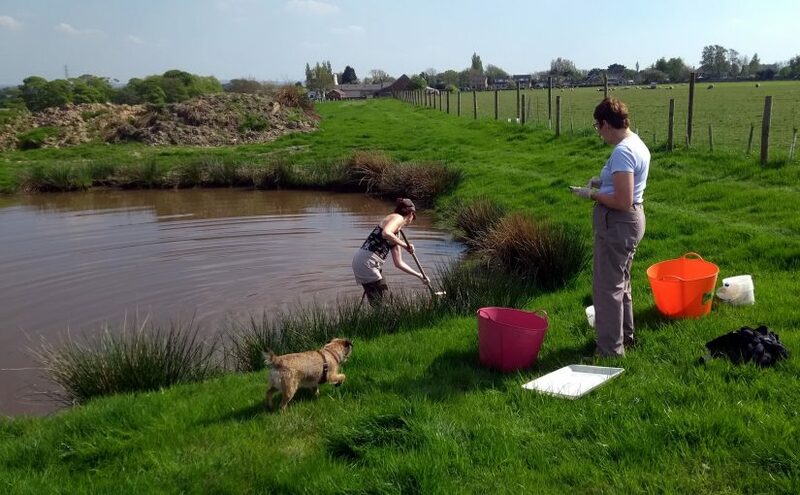 An out of the blue call from Helen Greaves changed the plans for the day as it became the day to do an audit of invertebrates in both the restored farm ponds and the newly created scrapes. A lovely hot sunny day isn’t the best sort of day to don waders but, if you want to count pond invertebrates, they are essential attire. Sherpa, helper and stopwatch operator were just some of the roles fulfilled by Helen’s mum with Millie the dog just enjoying the walk and the sunshine. A three minute sampling technique was interesting to watch and tubs of findings have been taken away for analysis. I really do hope we can share the data here in due course.